Dai Davies (11-23-2, 2KO) returned to his hometown of Merthyr Tydfil for the first time in seven years and produced his career best performance with an eighth round stoppage of Cefn Fforest’s Robbie Turley (13-5, 3KO). Davies, a three time Welsh champion, had never successfully defended a Welsh title until tonight and it was the perfect platform to do so, in his hometown and live on Eurosport. The headliner of Sanigar Events’ show was aptly named ‘Repeat Or Revenge’ show and it proved to be a ‘Repeat’ for Davies, who won their original encounter in 2009. 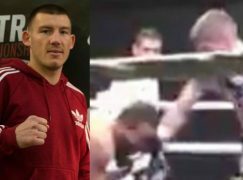 The end came as a tired out Turley was retired in his corner by his trainer Tony Borg, sending Davies’ fans mad and almost lifting the roof off the Merthyr Leisure Centre following a frantically fast paced fight. There are wet bars of soap that are less slippery than Turley but in the early stages, Davies’ jab was doing a good job of catching his opponent off balance as he tried to pivot away. The defending champion began brightly, settling behind his lead hand and his upper-body movement matched Turley’s typically elusive turns. 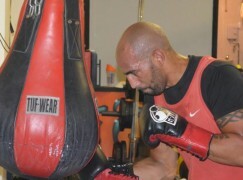 Turley turned southpaw as early as the second round but it was to little instant success, instead, Davies waited for the challenger to lunge in before countering Turley while he was off balance. The action would get messy up close but at mid-range, it was bombs away as both paid little regard to what was coming back and let their fists fly. It calmed, only a little, in the third as both attempted to tempt their rival to committing first. Although Turley was faster, Davies timed the exchanges and offset Turley’s centre of gravity to build an early lead that would’ve boosted the champions’ confidence. Turley, the challenger, enjoyed his best success at the end of the fifth as he began ducking and rising like a jack in the box to pop out of unorthodox angles that were out of Davies’ eye line. It continued in to the sixth as Davies tucked up and lent over his front foot, only to be lifted back up with uppercuts from Turley. 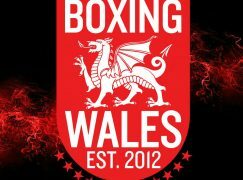 Observers initially thought that the tide was beginning to turn in the fifth and sixth rounds but it must have been a last hurrah from Turley as his energy levels hit their lowest in the seventh round which is a certain candidate for BoxingWales‘ 2014 Round of the Year. Davies’ steady jab manoeuvred a tired looking Turley to the ropes and trapped the 27-year-old on the edge of the ring. The champion couldn’t miss with either hand but Turley, whose mouth was open and almost gasping for a breather, dug in and loaded up to score his own punches. As Davies leant on Turley and Turley sagged on the ropes, the legs of both boxers had stopped working by this point and they, literally, stood still to slug it out for more than half a round. 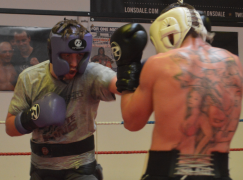 In the eighth, Turley appeared to be loading but Davies was wise to it and he continued to up the ante behind a tight guard, chipping away and it proved to be enough with Turley retired in his corner at the end of the round.